My recent travels to Ukraine featured a couple of days in Kiev, as well as pointing a gieger counter at Reactor 4 at Chernobyl. 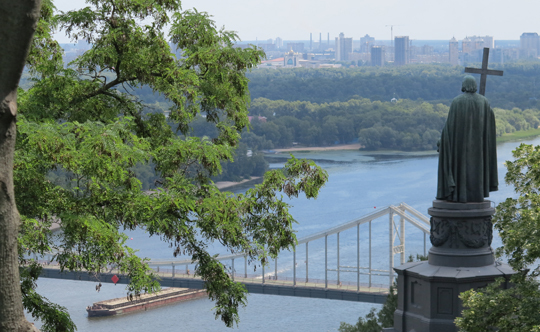 Kiev’s a surprisingly attractive city and there’s plenty to occupy a few days. ▲ Plenty of glittering Orthodox churches and cathedrals for a start. 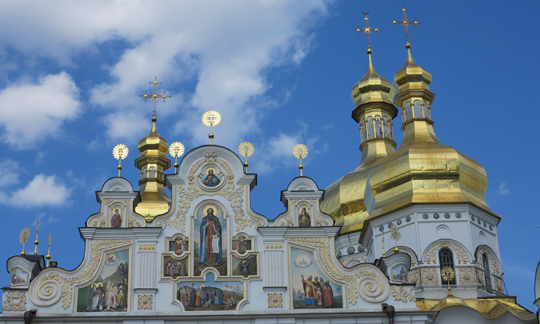 They don’t come much more golden and be-domed than the cathedral at Kyevo-Pecherska Lavra. 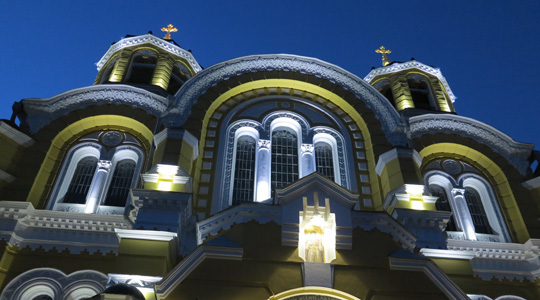 ▲ Although St Volodymyr’s Cathedral certainly doesn’t look bad. Plus I could see its collection of golden domes from my hotel room. Ukraine’s patron saint has a statue near my place in London, standing in front of the Ukraine Embassy and looking out at the busy traffic on Holland Park Ave.
▲ In Kiev he stands close to the centre, looking across the Dnieper River. Kiev has plenty of statues, many of them whimsical affairs for Ukraine poets and other cultural heroes. ◄ Although not every statue has survived so well. 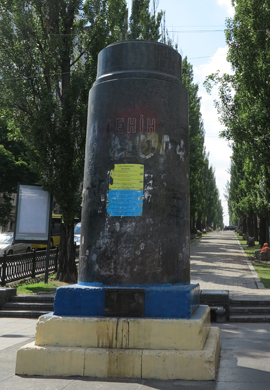 Here’s the empty plinth at the junction of Kreshchatyk, the city’s main promenade, and Tarasa Shevchenko Blvd, where a statue of Lenin used to stand until the Ukrainians, tore it down to indicate their displeasure with neighbouring Russia. ▲ More Orthodox architecture? 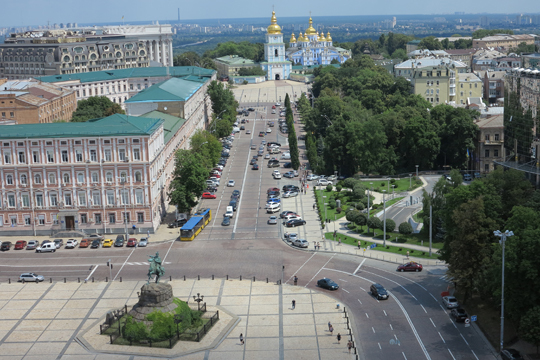 From the Bell Tower at St Sophia’s Cathedral this is the view over the Bohdan Khmelnytsky statue in Pl Sofiyska and down proyizd Volodymyrsky to the St Michael’s Monastery. It may look old but the 1108 original was torn down by Stalin’s Soviets in 1937, the modern replacement popped up in 2001. 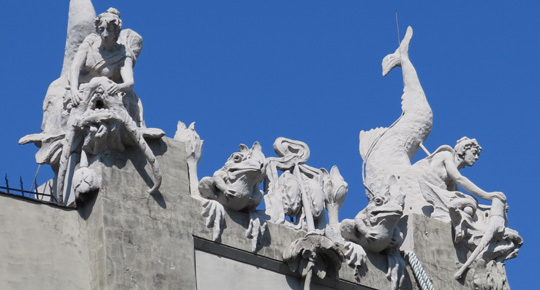 ▲Archictect Wladislaw Horodecki (alternatively Vladislav Gorodetsky) has been called the Antoni Gaudí of Kiev and his House of Chimeras with its fantastical concrete creatures writhing over their Art Nouveau home is a Kiev favourite. ▲Still more art? 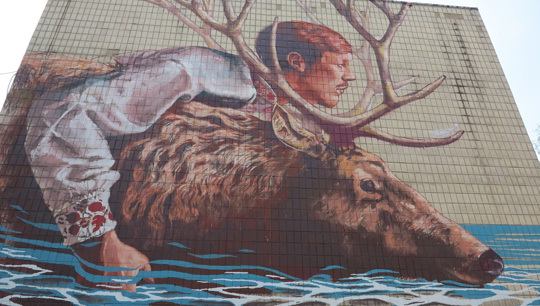 The Podil district has the not terribly interesting Chernobyl Museum and lots of buildings decorated with huge murals like this one.